The invention of numerals is perhaps the greatest abstraction the human mind has ever created. Virtually everything in our lives is digital, numerical, or quantified. The story of how and where we got these numerals, which we so depend on, has for thousands of years been shrouded in mystery. Finding zero is an adventure filled saga of Amir Aczel’s lifelong obsession: to find the original sources of our numerals. Aczel has doggedly crisscrossed the ancient world, scouring dusty, moldy texts, cross examining so-called scholars who offered wildly differing sets of facts, and ultimately penetrating deep into a Cambodian jungle to find a definitive proof. Here, he takes the reader along for the ride. 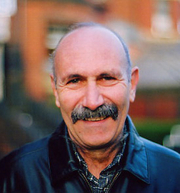 Amir D. Aczel is the author of fifteen books, including The Riddle of the Compass, The Mystery of the Aleph, and the international bestseller Fermat’s Last Theorem. An internationally known writer of mathematics and science, he is a fellow of the John Simon Guggenheim Memorial Foundation. He lives in Brookline, MA. Amir Aczel reads from Present at the Creation: The Story of CERN and the Large Hadron Collider. Amir Aczel reads from Uranium Wars: The Scientific Rivalry that Created the Nuclear Age . Amir D. Aczel's book Finding Zero:A Mathematician's Odyssey to Uncover the Origins of Numbers was available from LibraryThing Early Reviewers. Amir D. Aczel is currently considered a "single author." If one or more works are by a distinct, homonymous authors, go ahead and split the author. Amir D. Aczel is composed of 15 names. You can examine and separate out names.